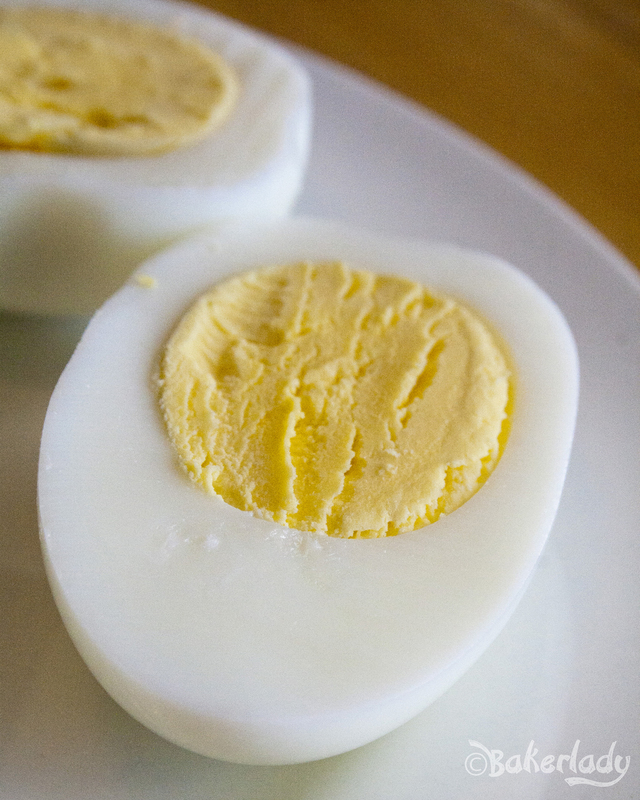 Start with some hard-boiled eggs. Or, if you prefer, you can bake them like Alton Brown does. He also explains why recipes work. Hmmm. I’m sensing a pattern in my recipe source preferences. Your eggs should be perfectly done. As in, no grey around the yolk. 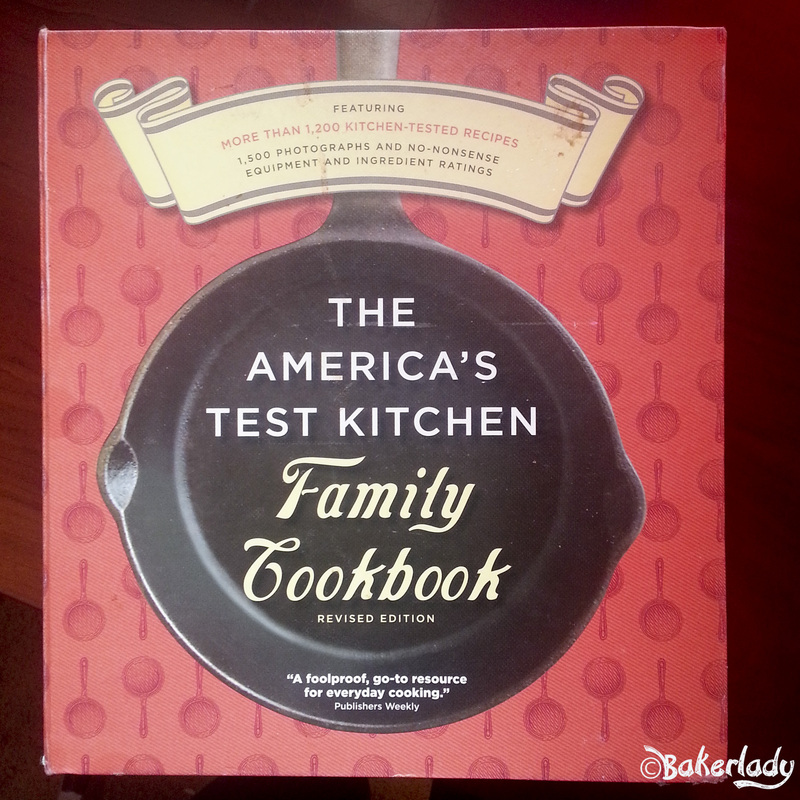 America’s Test Kitchen will get you a dozen deviled eggs per batch. 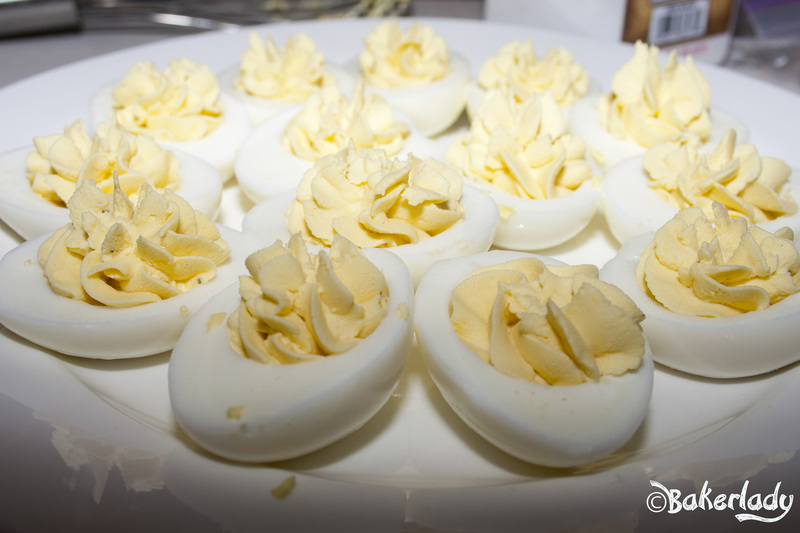 You can cook up several dozen hard-boiled eggs at a time with Alton’s baked recipe. Regardless, they’ll both turn out just like this. Peel, slice in half and remove the yolks to a bowl. Set your perfect whites on a platter. America’s Test Kitchen’s recipe has a couple extra whites built-in. Just in case any rip during the peeling/slicing process. 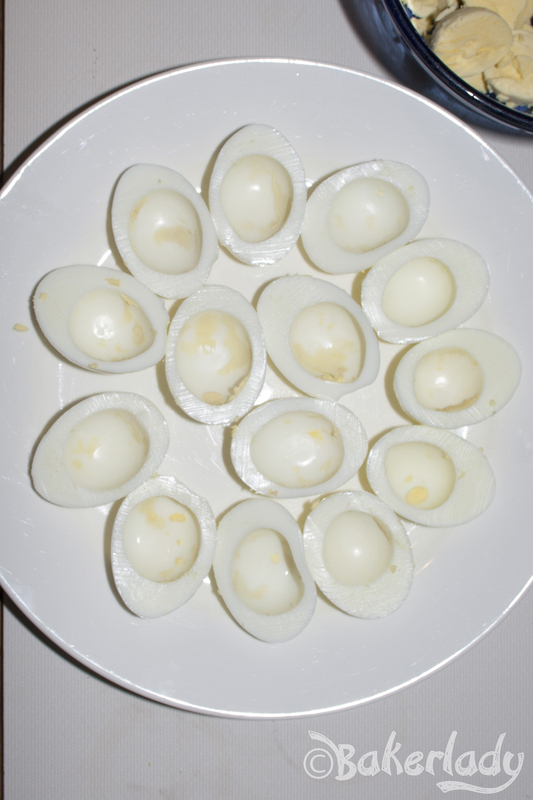 I’ve never really experienced broken whites because their cooking method for boiled eggs is so perfect. I find there’s always enough filling to pack into the full number of undamaged whites. 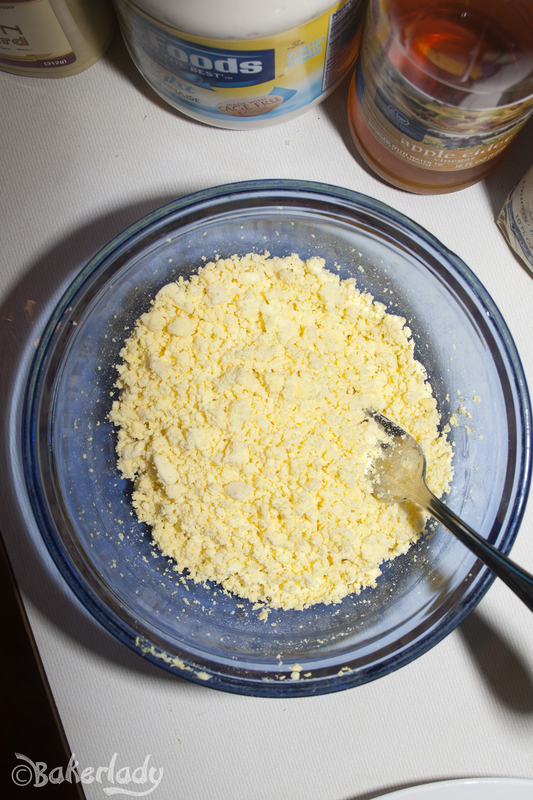 Then, with a fork, mash up the yolks into the smallest grains you can muster. 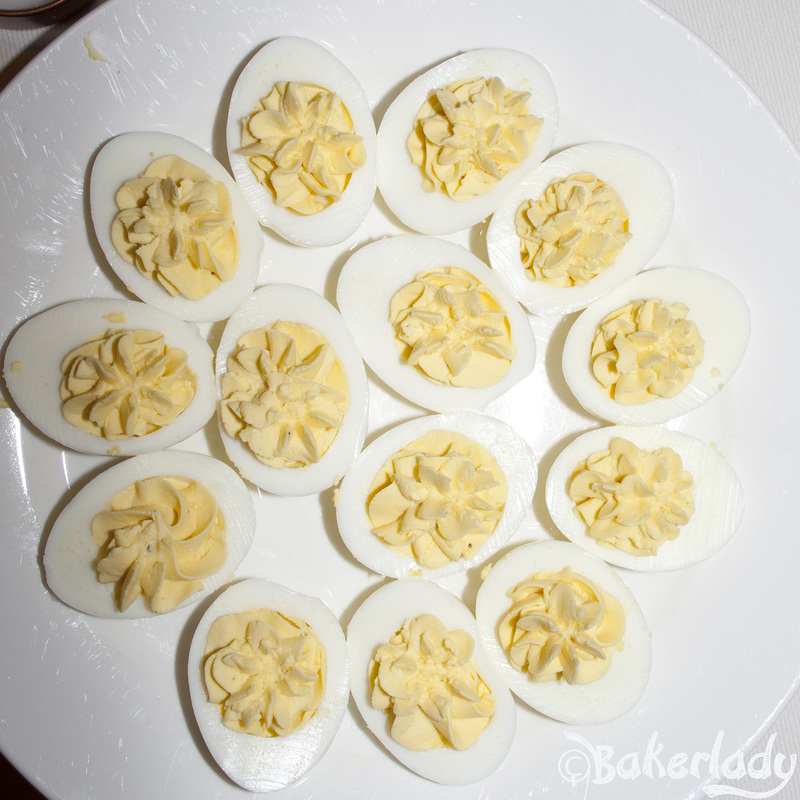 This step will produce creamy, fully incorporated deviled eggs without any lumpy bits of yolk. Just look at that gorgeous color. Not a hint of grey anywhere. 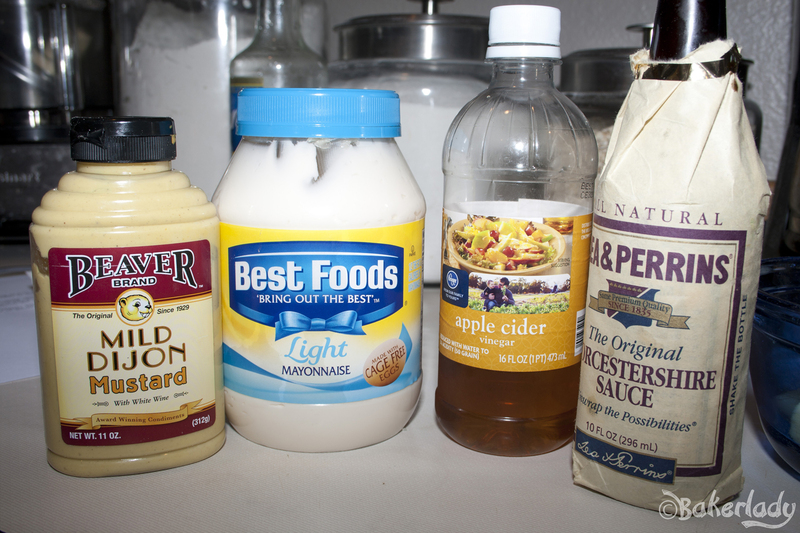 Now we’re going to add some creamy deliciousness with mayonnaise, cider vinegar, mustard and Worcestershire. Plus a little salt and pepper. Mix it all together well and pipe it into your whites. I use a star tip to make it extra fancy. However, you can use a ziplock bag with the edge snipped off, or even a spoon to scoop the filling into your eggs. My husband “needs” paprika sprinkled on his deviled eggs. I don’t see the point. He feels they are “naked” without little specks of red dotting the top of the piped filling. Something about childhood memories. Blah, blah, blah. Sprinkle if you must. Try them for me without? I like the flavor of egg in my deviled eggs, and think paprika just overpowers it. The choice is yours. But you should choose naked. I’ve heard eggs are nudists at heart. If you are looking for more great Easter foods like Hot Cross Buns or Lemon Monkey Bread, check out my post Easter Foods That Are Easier Than You’d Expect. Or for family activities this week, head over to Dissonant Symphony for Easter Fun for Everyone including Resurrection Rolls and Fingerprint Eggs! 1. Place eggs in medium saucepan, cover with 1 inch of water, and bring to boil over high heat. Remove pan from heat, cover, and let stand 10 minutes. Meanwhile, fill medium bowl with ice water. Transfer eggs to ice water with slotted spoon to stop cooking; let sit until chilled, about 5 minutes. 3. Fit pastry bag with large open-star tip. Fill bag with yolk mixture, twisting top of pastry bag to help push mixture toward tip of bag. Pipe yolk mixture into egg white halves, mounding filling about 1/2 inch above flat surface of whites. Serve at room temperature. A friend is searching for the America’s Test Kitchen deviled egg recipe that uses mayo and sour cream. Help, anyone? Please notify me jbfeaster@hotmail.com if you have the recipe, and thanks so much!